The new development, called American Village, spreads along Pritchard Drive, its apartments and single-family homes intermingling in a gated community restricted to people 55 and over. 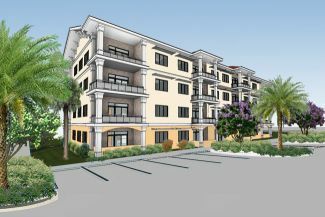 The Palm Coast Planning Board approved a master site plan Wednesday. Watering restrictions during Daylight Saving Time begin March 10 and run through Nov. 2 in 2019. Here’s the landscape irrigation policy for Palm Coast, aligning with the restrictions issued by the St. Johns River Water Management District. Palm Coast’s just-launched ditch-maintenance targets overgrowth of aquatic vegetation and plans are being developed to address localized drainage issues in the W, E, F and R sections. A Special Taxing District To Repair Palm Coast’s Privately Owned Sea Walls? Not Exactly. Is Palm Coast looking to create a taxing district to pay for privately owned seawall repairs on the city’s 26 miles of saltwater canals? Not exactly. Certainly not yet. But it’s not off the table. The average monthly residential bill for water and sewer is $65.76. It would rise to $79.33 by 2022, when the average annual bill will be $163 higher than it is now. The $100,000 would pay for a conceptual plan for the recreation center and potential aquatic center off Belle Terre Parkway, around the Palm Coast Tennis Center. Brisk construction activity in Palm Coast and Flagler is sending building inspections soaring, reflecting healthy but not boom-like activity in the sector. A proposed commercial development at the southeast corner of State Road 100 and the entrance to the county airport, opposite Bulldog Drive, is at the center of the latest water dispute between Palm Coast and the county. Palm Coast council member blames the city administration for not acting on several proposals to help reduce traffic, pollution and noise along Florida Park Drive. The new RaceTrac gas station is a breakthrough for the long-dormant Kings Pointe development, until now one of the symbols of the housing collapse. The $8 million renovation more than triples the size of the old building to 18,000 square feet, with ample and handsome spaces inside and out, including a renovated public park. Documents obtained by FlaglerLive and disclosed for the first time show the extent of Palm Coast Data’s difficulties and some of Palm Coast government’s own deception along the way. 86 injuries from 60 crashes in three years and the lack of a bike and footpath led Palm Coast to plan for reducing a stretch of Whiteview from four to two lanes. The apartment complex will be called Shadetree at Bunnell, with rent averaging $1,300 a month, on 30 acres abutting Palm Coast’s E-Section. The Bunnell Planning Board quietly approved an exception so the buildings could be exceed the city’s height limit. The development was once called Harbor View Marina. It will now be called Marina Del Palma and will add up to 615 residential units, 461 of them in condo towers of eight stories. Housing, real estate and local government officials this morning diagnosed the sources of Flagler-Palm Coast’s affordable housing crisis and proposed a few solutions in a unique discussion at the Hilton Garden Inn. Hidden Lakes residents spoke in opposition to a zoning change allowing a 136-unit apartment complex at Old Kings Road just north of Kings Pointe. International House of Pancakes will open near the Island Walk Starbucks on Palm Coast Parkway. And Chipotle will open next to Panera Bread on State Road 100. A raucous, emotional meeting at Matanzas High pitted proponents of a foot and bike path through the heart of the F Section against opponents who say it’s misplaced and ill-advised. A year behind schedule, the reopening of Holland Park, now scheduled for June, will also mark the transformation of an eyesore into a crown jewel, as a visit to the park today suggests. There’s a ribbon-cutting for every imaginable non-event these days, and today Palm Coast cut the ribbon at a water-control structure called a “weir,” in the B-Section. Palm Coast’s government’s claim that it didn’t have the money to build sidewalks and street lights is a cynical lie: as people died, the city put luxury ahead of necessity, from city hall to expensive beautification and plenty more. A 2,200-square-foot Starbucks just got a development order and will soon rise next to Aldi, Gate gas station and Tractor Supply Co at Belle Terre and SR100. A proposed 250-unit apartment complex of SR100 in Bunnell but abutting the E-Section, drew out more than 100 Palm Coast residents at a zoning hearing that ended with the rom being cleared because of the crowd’s misbehavior. The decision was made recently and unexpectedly by Palm Coast Holding’s parent company, Allete Properties of Duluth, Minn. Seven employees will be affected. From the eyes and ears of neighborhood watch groups to programs for youths and the elderly, Palm Coast City Council member Heidi Shipley envisions the best the city has to offer in the third of five articles on the future by council members. City Manager Jim Landon had first estimated a “$3 to $4 million” renovation cost, but then delayed it to build an addition to City Hall, ostensibly to save money. Community Center costs have now more than erased those savings, Council member Steven Nobile says.